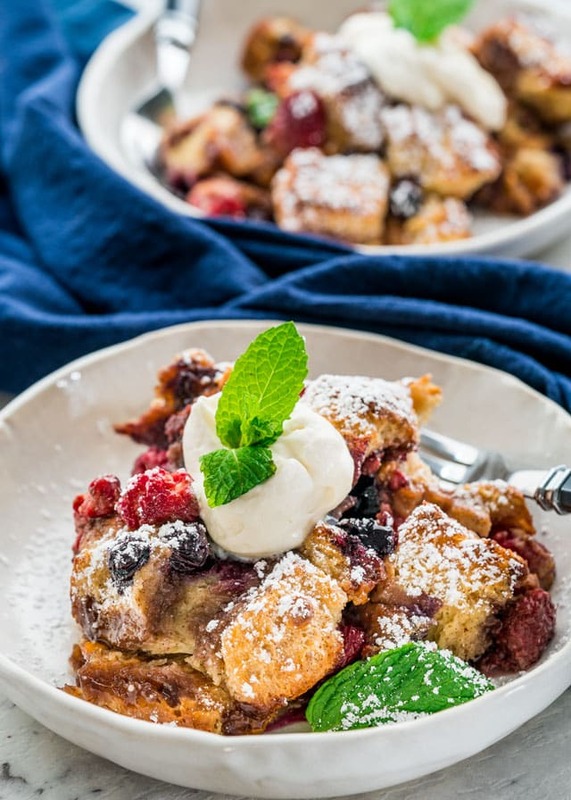 This decadent Berry Brioche Bread Pudding is crammed full of blueberries, raspberries and butterscotch chips. An indulgent dessert that is a favorite with everyone! I’ll have to admit that bread pudding is not something that I grew up with, but something I fell in love with as an adult. While bread pudding is not the prettiest looking, and I admit that I hate shooting bread puddings, it sure makes up for in flavor what it lacks in looks. 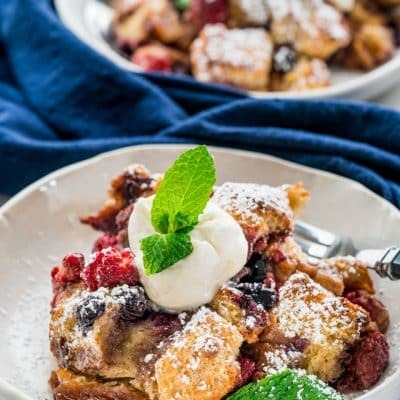 I love making bread puddings because they are so easy to put together, and what’s not to love about bread in a custard like sauce loaded with berries, or caramel sauces and topped with whipped cream and more sauces. Yeah, it’s pretty darn delicious! First important ingredient in a good bread pudding is the bread and I find that brioche is my bread of choice when it comes to making an incredible and outstanding pudding. Brioche bread is rich and a bit sweet and it’s perfect for soaking up all that cream like a sponge. Of course, brioche is not the only bread you can use. You can use just about any rich or sweet bread you have, such as challah, raisin bread, even a plain white bread and if you prefer a bit more sweetness cinnamon rolls. 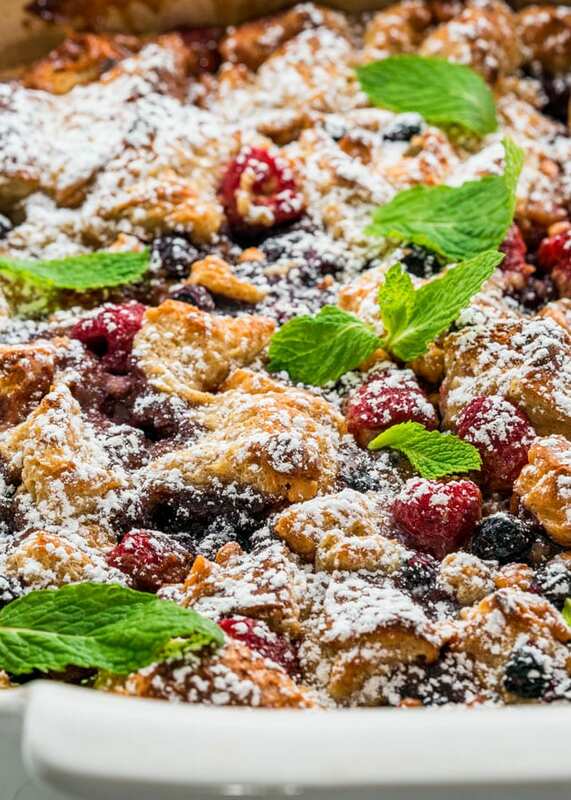 The great thing about bread puddings is that they really are versatile. There are so many different versions you can make but for my holiday bread pudding here, I thought berries and butterscotch chips are the way to go. I just love the addition of butterscotch chips to this bread pudding, it adds a bit more sweetness and that caramel flavor that is to die for. Berries and butterscotch really is a good thing when paired together, a must try. But then bread puddings are the perfect dessert because not only are they incredible on their own, you can top them with more good things like caramel sauce, maple syrup, ice cream, you name it. Spray a 9x13 inch casserole dish with cooking spray or coat it with butter. Slice the brioche bread into 1" cubes and transfer to the prepared casserole dish. Whisk the eggs with the sugar together first. Add the vanilla extract, cinnamon, nutmeg, salt and whisk. Whisk in the half and half. Pour over the cubed brioche, cover with plastic wrap then chill for at least 20 minutes to overnight. Remove the casserole dish from the fridge and fold in the berries and butterscotch chips. Cover with aluminum foil and bake for 45 minutes. Remove the foil, turn the oven up to 425F, and bake for an additional 15 minutes or until golden brown. Transfer the baking dish to a cooling rack and let cool for about 10 minutes before sprinkling with powdered sugar. Serve warm. What is half and half: Half and half is a blend of equal parts whole milk and light cream. It averages 10 to 12% of fat. Half and half can be found near the milk and cream in the dairy section of your local grocery store. I don't have a brioche bread, can I use any other kind of bread: Yes, absolutely! You can use any plain white bread thick cut like Texas toast, or rich and sweet bread such as raisin bread, hot cross buns, challah or even cinnamon rolls. How do I store leftovers: Transfer leftovers to an airtight container and store in the fridge for up to 5 days. Serve cold, or warmed up. What other optional toppings can I use: You can drizzle some maple syrup over the pudding, or caramel sauce or top with whipped cream. Can I make this in individual ramekins: Absolutely! You can prepare everything in a large dish then transfer to individual ramekins before chilling in the fridge. Bake as normal, but remove the aluminum foil after 15 minutes and bake for another 5 minutes or until golden brown. I made this for a dinner party and everyone loved it! Will definitely make it again soon.